For instance, take the current debate about an overhaul of the nation's tax code. The “get the government off my back” crowd is leading the tax cut charge. I am perplexed by this because when it comes to freeloading off the federal government the so-called “red states” are leading the way. These states receive more from the federal government than they pay into the system. 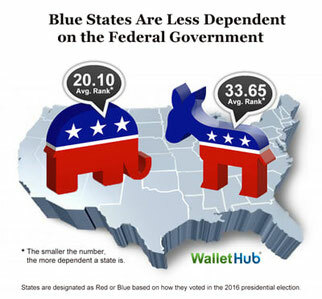 According to Wallet Hub, the top ten states most dependent on the federal government for 2017 are: 10) Indiana, 9) Maine, 8) Tennessee, 7) Montana, 6) South Carolina, 5) West Virginia, 4) Alabama, 3) New Mexico, 2) Mississippi, and 1) Kentucky. Nine of these are led by Republican administrations, with Montana being the exception. The five states least dependent on the feds are: California (blue), Illinois (red), New Jersey(red), Minnesota (blue), and Delaware (blue). Michigan finished at 33. The average federal dependency of the red states is 20.10 compared to the blue's 33.65 (lower number equals more dependent). The court will decide the case next week . If convicted, the mom faces up to ten years in prison and up to a $25,000 fine. No word on whether the son will testify on behalf of his mom. He's probably still picking the bugs from his teeth. It's a head-scratcher.